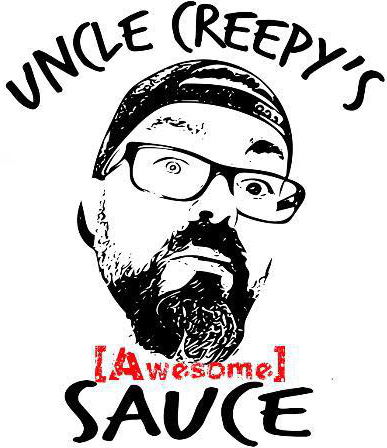 Uncle Creepy’s Awesome Sauce is one of the amazing flavors released by Uncle Mike’s Elixir. 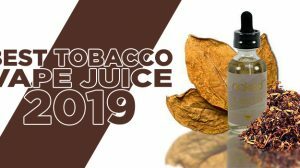 Fun and games on the outside, but nothing but business behind the label is the way I would describe, not only this e-liquid, but also the man behind it all. Let’s take the next couple of minutes to talk about the packaging, the flavor, the vapor production, and the man behind the creepy label. Getting under the distribution umbrella’s of 3D AND Cloud Chasers inc. is all but impossible, but this company has managed it with their various lines. If there is a convention on the circuit, you are sure to see them represented by the man behind the cartoons. I had the chance to briefly meet with him at VaperSlam 2, chat with him and realize that he and his product are quite literally one and the same. One hundred percent of his heart and soul go into every product he sends to his customers — you can tell that this is a man who cares about the industry and the community. He isn’t just there to make money, but to ensure that vapers have the greatest experience possible. 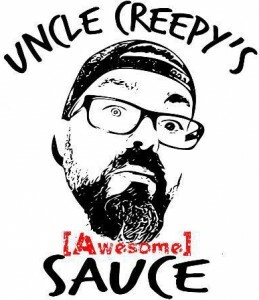 If you can get past the fact that Uncle Creepy looks at you judgmentally every time you pick up his awesome sauce – he is telling you to put it down as he stares into your soul – you may just be in for a treat. The bottle I will be reviewing today was picked up from the man himself at VaperSlam 2 in Charlotte, NC and has been sitting on my shelf, staring at me for the last week. Clean and simple are the best words to describe this bottle of e-liquid. 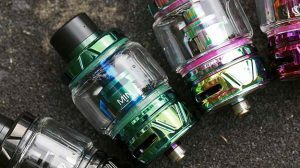 Clear glass, dripper style child proof cap in black. From the front face of the bottle, the only color in the monochromatic scheme is the “awesome” in awesome sauce, and a tiny flag at the bottom saying “Murica”. The side of the bottle has all the normal warnings you would associate with e-liquids and the contents of the bottle. Flip the bottle over and you will find the Prop 65 warning and in font you can read across the room the nicotine strength of the e-liquid. Even though this bottle has been siting in direct light for a week, the contents are still as clear as the day they were mixed and I can’t wait to open it up. They haven’t tried to sell the product with fancy packaging or fancy descriptions to draw customers in, but in my humble opinion they will draw lifelong customers in with flavors like this. There is no taste of sweeteners, nothing added to mute or interfere with the flavor they were aiming for, it literally tastes of sweet, juicy apples with a face full of strawberries. Running between 60 and 120 watts, the flavor only intensifies and remains on your palette only briefly before disappearing forever.. or at least until the next hit. It is what it is, it doesn’t pretend to be better than it should be, as this is an e-liquid that has the power to sell itself on taste alone. The company put “Awesome Sauce” on the label and in the bottle, and that is all I will say. As a max VG e-liquid, I would expect Uncle Creepy’s Awesome Sauce to plume like crazy. It doesn’t disappoint. 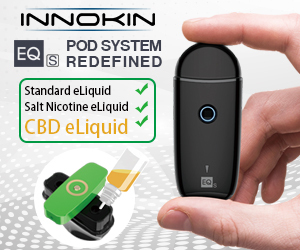 For those who aren’t looking to create thick dense fog every time they hit their mod, this is probably not a product for you. If you like hurling 10 foot clouds of vapor across the room, with maximum flavor getting through to your taste buds – you need to try this. 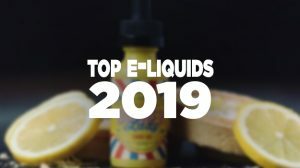 The only other point that I can make about this e-liquid is one that we have mentioned on the odd occasion the fact that Awesome Sauce is only available in 0, 3 and 6 mg. From the business standpoint, I understand exactly why this is the case but from the community stand point, by only offering such a small offering the company are cutting off a plethora of potential customers. Then again, I have to admit, if a customer emailed and asked for a bottle in 24 mg/ml, they would probably make it happen. 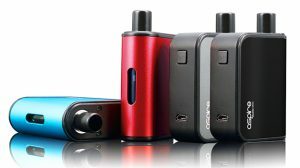 Well I wast just looking to add some new tastes to my e-liquids collections. I will try this one soon. Great review btw.